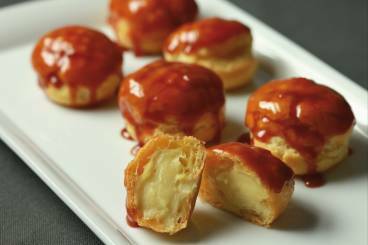 A profiterole is a small, choux pastry ball usually filled with cream using a piping bag and topped with chocolate or caramel sauce. When assembled into a tall structure, a croquembouche often forms an impressive centrepiece at French weddings. Profiteroles dipped in coffee cream and filled with a light espresso pastry cream. Profiteroles dipped in lemon icing and filled with a light lemon flavoured pastry cream. Profiteroles dipped in chocolate and filled with a light praline cream. 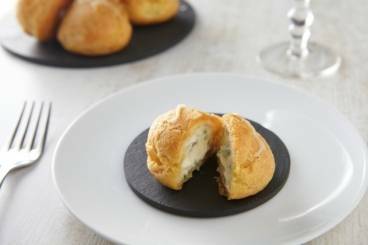 Savoury profiteroles stuffed with truffled mascarpone cheese and snipped chives. Savoury profiteroles made with gruyère cheese and smoked paprika served with a light roquefort foam.